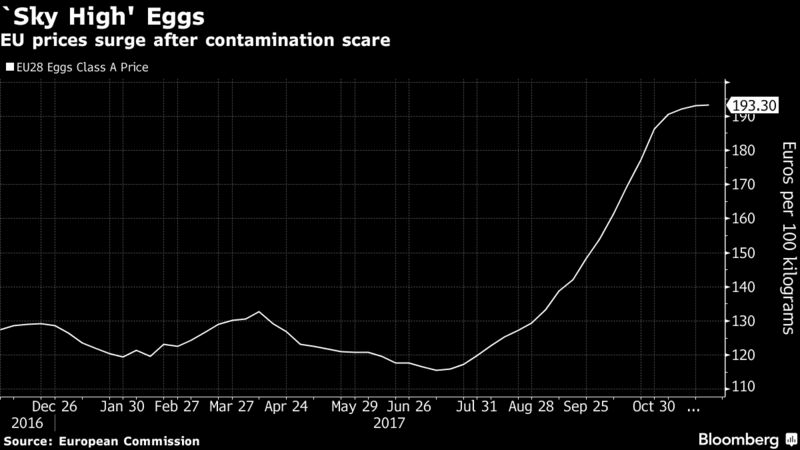 Egg costs are surging in Europe after a contamination scare swept across the region earlier this year. Worries about eggs tainted with the insecticide fipronil led supermarkets in several countries to pull cartons from stores. While the market appears to have adequate supply, fears of a shortage fueled a “major price surge,” the U.S. Department of Agriculture said in a Dec. 1 report. European food-processing companies have been complaining about high egg prices as the industry prepares for rising demand for the holiday baking season, the USDA said. While the fipronil crisis caused production to drop in Belgium and the Netherlands, egg production in the European Union hasn’t declined from 2016. The U.S. became the top egg exporter to the EU this year, and American prices recently rebounded from a lengthy slump.